Sign up here to receive Healing Circle Massage's bimonthly newsletter. We provide practical tips for better health with articles, breaking health news and product recommendations. We respect your privacy and will never sell or give out your information. This book, a companion to Conquer your Stress at Work is made to cover common issues in the workplace. Learn how to fit in fitness, what nutrition choices will work best for you, stretches to stay healthy and how to boost your energy in the afternoon. Special tips are included for job specifics like sitting all day, driving, standing all day and heavy lifting. An encyclopedia of tips to keep you healthy during the workday whether at a desk, in the car, on a construction site or sitting at a home office. Perfect for every profession. 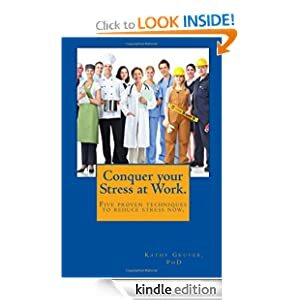 This book teaches five techniques to reduce stress in the workplace. Starting with basic breath work, then moving to affirmations, visualization, mindfulness and a simple meditation. These methods are proven to not only reduce stress, but also enhance performance, improve communication and increase health. Also covered are warning signs of stress, what mind/body medicine really is and how to incorporate these techniques. As a young child, Kathy Gruver discovered a gift for helping, first by massaging her father's neck during car trips, then by assisting a massage therapist who took the kinks out of Gruver and her fellow college acting students. An only child, unpopular in school, she watched her mother suffer with cancer for nine years, and observed her father as devoted caregiver. Finding outlets in theatre and dance, Gruver came west to forge a career as an actress. Along the way, she discovered healing modalities, became a massage therapist, and shares her gift of finding what her clients' real problems were beyond their presenting symptoms. She continued to pursue higher learning and advanced degrees. Her motto: Go for it. Her desire in life: helping others. To become the best at what she does, she delved deeply into numerous modalities, which she shares with readers, liberally sprinkled with detailed information as well as anecdotes both heartwarming and heartbreaking, about herself and her many memorable clients over the last twenty years. Gruver demystifies nutrition, meditation, reiki, massage (even how to set up your own practice, as well as the numerous opportunities for employment in the field and how to determine the one for you), homeopathy, herbs, affirmations, cancer, hypnosis, and more. Gruver's literal journey led her to such places as Stonehenge and flying trapeze; her journey toward self-acceptance was furthered as an artist's model and being stranded in a foreign country. While her journey may not be ours, it's there for us to savor and learn and grow. Learn tips from two pros about how to build your business from day one to closing day. Topics covered include online marketing, social media, business plans, headshots, elevator speeches, audits and getting sued to selling your practice. A must for anyone who wants to be a successful alternative medicine practitioner. Co-written with Steven Brynoff. To order by phone, call (805) 680-1984.
Credit cards accepted over the phone. 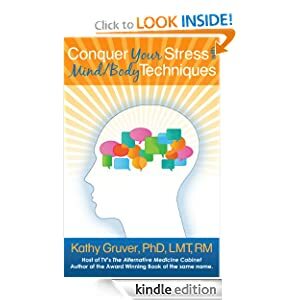 Buy Conquer Your Stress with Mind/Body Techniques and add The Alternative Medicine Cabinet for only $10 more! We've all felt stress, but what it is really and what is it doing to our health? Conquer your Stress with Mind/Body Techniques is a handbook allowing you to gain control over your reaction to stress. Learn the current theories and techniques to put you back in charge. This fun, easy to read book covers meditation, visualization, affirmations, prayer, yoga, massage, pain management and dozens of techniques you can employ to help strengthen your mind/body connection. Pick one up today. A handbook of resources to enhance your practice and help more clients heal with mind-body medicine. 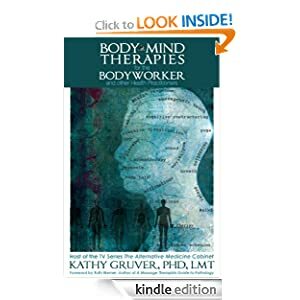 If you are a bodyworker or health professional interested in adding mind/body therapies to your practice and your life, this is your book. Learn about the stress response, placebo effect and fundamentals of mind/body communication. You will understand the specific ways these methods can enhance the healing of your clients and learn multitudes of modalities you can add to help more people, increase your income and experience the new paradigm of the mind/body connection. Foreword by Ruth Werner. If only everyone would honestly ask "Who's the Matter with Me" and recognize that it is usually you, yourself, we would all be better. Meanwhile, as Kathy reveals, body workers may help a great deal more than mind workers! 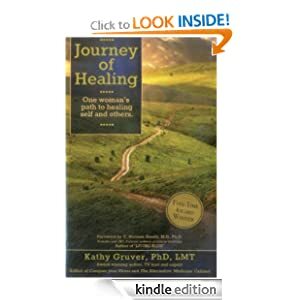 C. Norman Shealy, M.D., Ph.D.
Kathy Gruver is a life-long learner dedicated to holistic wellness and the bodywork profession. She's poured her knowledge - and heart and soul- into this text. There are gems of insight here for everyone from practitioners to clients. My hope is readers will honor Gruver by enjoying this text and living well. Dr. Kathy Gruver writes in a candid, down-to-earth style that makes it easy to comprehend her powerful message. She provides logical and inspirational information for bodyworkers to elevate their level of wellness and that of their clients. The relevancy of mind/body dynamics that Dr. Gruver brings to light reaches all of us. 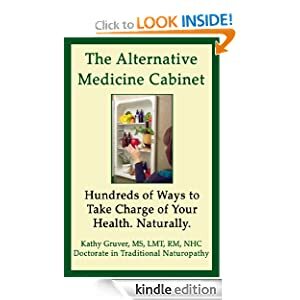 Get The Alternative Medicine Cabinet for only $10 more when you purchase Kathy's new book, Conquer Your Stress with Mind/Body Techniques! Learn how to rely less on surgery and medication. Regain control of your health. And close this book with a better grasp of natural health techniques for you and your family. To order by phone, please call (805) 680-1984. Made for the beginner, this DVD teaches safe and effective massage for home health. Follow along with Kathy Gruver, a Certified Medical Massage Therapist, to learn a comprehensive back and neck massage in the comfort of your own home. Already massage your loved ones? Hone your technique and protect your hands. Always wanted to learn massage? Either way, this DVD is for you! The instruction was easy to understand and detailed without being monotonous; diction was clear, distinct and expressive; music was original and soothing; and the organization was good, I particularly liked the 'with' and 'without' instruction sections. I can't wait to get home and try it. My husband was having a really bad headache and I remembered the technique that you showed in the DVD. I tried it on him and his headache went away. I was so touched that I could help him relieve his pain. Thanks!